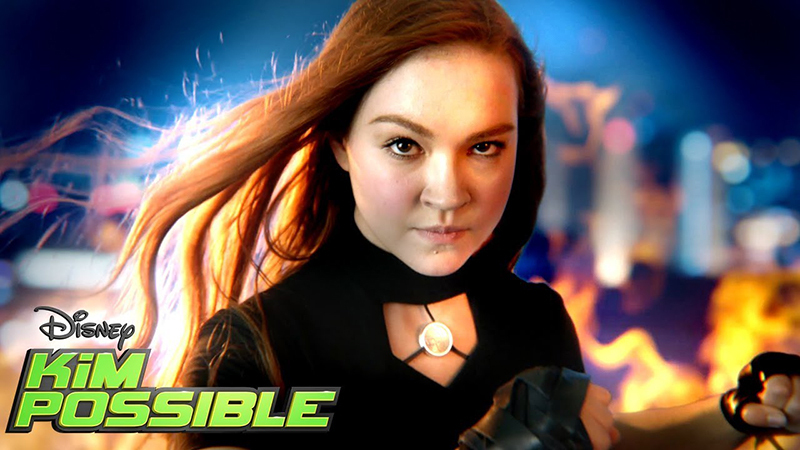 Disney has released the official trailer for their upcoming live-action movie based on the animated hit series Kim Possible starring Sadie Stanley (The Goldbergs). The movie will premiere on Friday, February 15 at 8:00 ET/PT on Disney Channel and DisneyNOW. Check out the trailer below as well as the synopsis for the film (via Deadline). In the live-action Kim Possible movie, Kim and her best friend and sidekick, Ron Stoppable, start Middleton High School, where Kim must navigate an intimidating new social hierarchy. She is ready to tackle the challenge head-on, just as she has with everything else in life, but her confidence is shaken when she faces roadblocks at every turn — getting lost in the confusing hallways, being late to class and facing rejection during soccer tryouts from her frenemy, Bonnie. Kim’s day starts to turn around when she and Ron meet and befriend Athena, a new classmate and Kim Possible superfan who is having an even worse day than Kim. With Kim’s guidance and friendship, Athena transforms into the newest member of Team Possible. Soon, Athena starts to eclipse Kim just as the nefarious Drakken and Shego resurface in Middleton with a master plan to finally stop Kim. Now it’s up to Team Possible — Kim, Ron, tech-genius Wade, new friend Athena and Rufus, a Naked mole-rat that Ron meets along the way — to stop these super villains. Joining Stanley in the film are Sean Giambrone (The Goldbergs) as Kim Possible’s loyal best friend, Ron Stoppable; Alyson Hannigan (How I Met Your Mother) as brain surgeon Dr. Ann Possible (AKA Mom Possible); Todd Stashwick (12 Monkeys) and Taylor Ortega will play fan-favorite villains Drakken and Shego, respectively; Connie Ray (The Big C) as grandmother Nana Possible; Ciara Wilson (OMG!) as new high school student Athena; Erika Tham (Make It Pop) as Kim’s childhood frenemy, Bonnie and Issac Ryan Brown (Raven’s Home) as teen computer genius Wade. In addition, it’s been confirmed that voice actors from the original animated series Christy Carlson Romano (the voice of the original Kim Possible) and Patton Oswalt (the voice of Professor Dementor) have joined the cast of the live-action film in undisclosed roles. The script will be written by Kim Possible creators Mark McCorkle and Bob Schooley (Big Hero 6: The Series, The Penguins of Madagascar), and Josh Cagan (The DUFF, Bandslam). McCorkle and Schooley will also serve as Executive Producers along with Zanne Devine, whose producing credits include I, Tonya and Easy A. Adam B. Stein and Zach Lipovsky (both of Disney XD’s MECH-X4) will co-direct and co-produce the film. Kim Possible got its start as an animated comedy/adventure series in 2002, centering on the title character who uses her brain, heart, and expertise to save the day. The show ran for 87 episodes and inspired two popular animated original movies. Those include 2005’s Kim Possible Movie: So the Drama, which was the first animated title in the Disney Channel Original Movie franchise, and 2003’s Kim Possible: A Stitch in Time. The live-action Kim Possible movie will debut on The Disney Channel sometime in 2019. The post Live-Action Kim Possible Trailer and Premiere Date Released appeared first on ComingSoon.net.